Apple have come out fighting against a burgeoning wave of competition in the tablet market with the release of the iPad Air and a new version of their iPad mini. With Christmas approaching and a flurry of ever cheaper tablets hitting the market as the likes of Tesco and Argos muscle in alongside Google and Amazon, Apple are relying on this launch to defend their supremacy. It comes as analysts are suggesting that Google's Android is about to overtake Apple's iOS as the bestselling tablet platform. 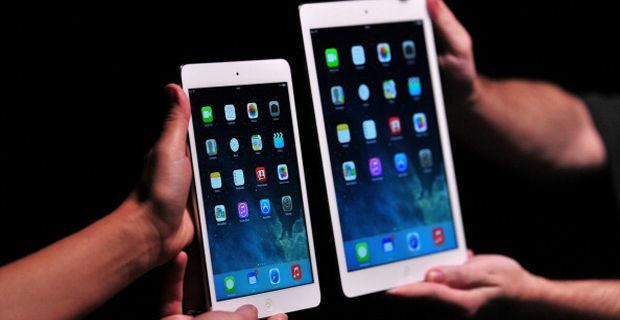 The iPad Air is the new top of the range Apple tablet that is 20% thinner than the previous version. The 9.7in (24.6cm) computer is 7.5mm (0.3in) thick and weighs 1lb (469g), which the tech giant claims is the lightest full-sized tablet on the market. It is powered by the same A7 chip used in the company's iPhone 5S and is priced at £399 ($499). Tim Cook, Apple's chief executive sought to dismiss his rivals, saying: "Everyone seems to be making a tablet, even some of the doubters. But regardless of what you might hear or read about how many are bought or sold or activated, iPad is used a lot more." Cook went on to point out that iPad had sold 170m units, which he said was "four times more than all of those other tablets put together, and this is what is important to us, because when you make a great product with a great experience, this is how you know it, because people use it and, even more important to us, people love it." "These new iPads underline Apple's dominance of the premium tablet market," said Ben Wood, chief of research at CCS Insight. "Apple seems determined to disrupt Microsoft's business model. Apple's strength in hardware is allowing it make free updates to its OS X operating system and offer its iLife suite free of charge with new devices. That's a real headache for Microsoft, whose business model for Windows and Office depends on licence fees and upgrade charges."